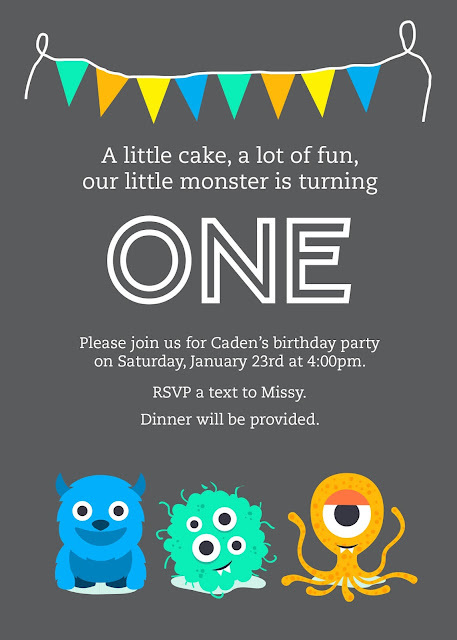 My sister’s baby boy turned one last month and she asked me to whip up a little invitation. Although this was a party for a one year old, that didn’t stop his older siblings from wanting to throw him a party! His sisters made a “Create a Monster” game where they had cut out different shapes of bodies, eyes, arms, feet, mouths, teeth, and horns to create your very own paper monster. There was also a “Pin the Eyeball on the Monster” and “Don’t Eat Pete” monster themed. And let’s not forget all of the monster themed food she had! Her little cutie had a great party with a great family who all pitched in to help. Thanks for designing this. It was perfect!